And he will wear No 23 again after Liverpool allocated him the same jersey. Shaqiri has long been Switzerland’s No 23, but this season will be the first time he has worn it at club level. He was Stoke’s No 22, Inter Milan’s No 91, Bayern Munich’s No 11 and FC Basel’s No 17. Liverpool’s No 23 jersey has plenty of history. Legends Robbie Fowler and Jamie Carragher have both worn it during the Premier League era. 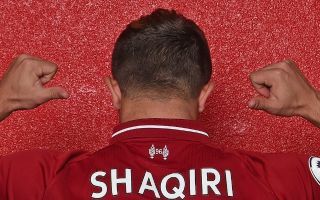 Former defender Carragher responded to the news of Shaqiri’s arrival by posting an amusing message to Instagram. He wrote: “Score as many as me in the 23 & you’ll be a bargain! Look after it Shaq”. Carragher scored four times – not including own goals – in over 700 matches for the Reds between 1994 and 2013.